Size: 738 sq.ft. - 1736 sq.ft. "Meydan Sobha" has differentiated the new community through a master plan of more than 60 per cent open and green space among its homes and amenities. 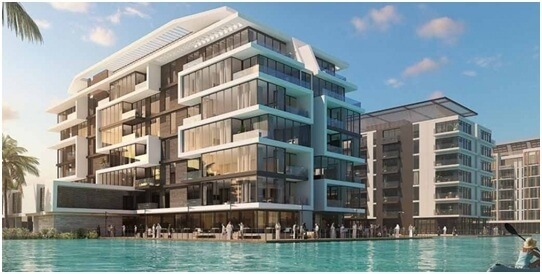 District One Residences is a joint venture between Sobha & Meydan Developers. Meydan Sobha have choices from one, two and three bedroom homes. The project is spanning four to sixteen storeys from the ground up and the cosy comfort of a home surrounded in lush greenery. These spacious homes are available with attractive payment plans. District One is a gated community consists five different towers stands Ground+4, Ground+6, Ground+8, Ground+12 and Ground+16 with different sizes apartments of 1, 2 & 3 Bedrooms. 4, 5 and 6 Bedrooms Villas. Seven & Eight Bedroom Mansions. The luxury Villas and Mansions are available from AED 14.7 Million. The new apartment complex is part of Phase 3 of the 45 million sq ft community, and comprises of one, two and three-bedroom apartments. The Residences will complement the villas and mansions of Phases 1 and 2. District One will probably be Dubai's most premier residential address rivalling the VIP addresses of Jumeirah, Palm Jumeirah, Emirates Hills and certain clusters within Dubai Hills Estates. The project is directly situated on the world’s largest crystal lagoon. Home Buyers are close to all the major routes into the city, providing quick access to the Dubai International Financial Centre, Downtown Dubai, Dubai World Trade Center and Dubai International Airport. District One brings together a 7km Water Body, sublime beaches, a 14km boardwalk, sweeping parklands and breath-taking architecture. The location is very close to Meydan Hotel & Meydan One Mall. District One Residences by Meydan Sobha Group is coming up at Mohammed Bin Rashid Al Maktoum City, Dubai, United Arab Emirates. The community has plenty of amenities and facilities such as Basement parking, BBQ area, Broadband ready, Built in wardrobes, Carpets, Central air conditioning, Covered parking, Fully fitted kitchen, Gazebo and outdoor entertaining area, Gymnasium, Intercom, Jacuzzi, Kitchen white goods, Maid's room, Marble floors, On high floor, Part furnished, Professionally landscaped garden, Satellite/Cable TV, Sauna Shared swimming pool, Solid wood floors, Basketball Court, Beach Access, Bus services, Business Center, Children's nursery, Steam room, Upgraded interior, View of sea/water, 24 hours Maintenance, Children's play area, Clubhouse, Communal gardens, Concierge service, Cycling tracks, Public park, Public parking, Recreational Facilities, Sports academies, Squash courts, Tennis courts, Valet Service, Walking Trails, Fitness Center, Golf club, Laundry Service, Mosque, Polo club and clubhouse.